Not to be confused with Shadowrun Returns, it’s online cousin Shadowrun Online dropped (in its Early Access version, that is) to excited chummers everywhere last Tuesday, April 1st. As of now there are four single player missions and a multiplayer PvP “Arena.” This video and post focuses on the single player missions. I do plan to wade into multiplayer and get geeked on your behalf just as soon as time allows. So this Early Access version is in no way reflective of what the full, finished game is intended to be. Fair enough, I get that. Yet, for the purposes of this post I have to go with what I have in front of me, not what is coming down the pike. If you’re just itching to watch the Shane Plays Let’s Play video of the four single player missions, here it is. My thoughts and whatnot will follow below. First, I have no choice but to say that the game in it’s current form is indeed extremely limited. The missions are basically combat scenarios with a bit of flavor text for the intro and outro. There is no character generation. There are no mission rewards or Karma to accumulate and spend. You are basically dropped on a series of maps that you fight your way through with an increasingly nasty amount of enemies for each map. You’ll find yourself flailing around and clicking somewhat desperately, trying to figure out how things work, looking for options that aren’t there, trying to access your inventory (which once again isn’t there) and general figuring things out through trial and error. 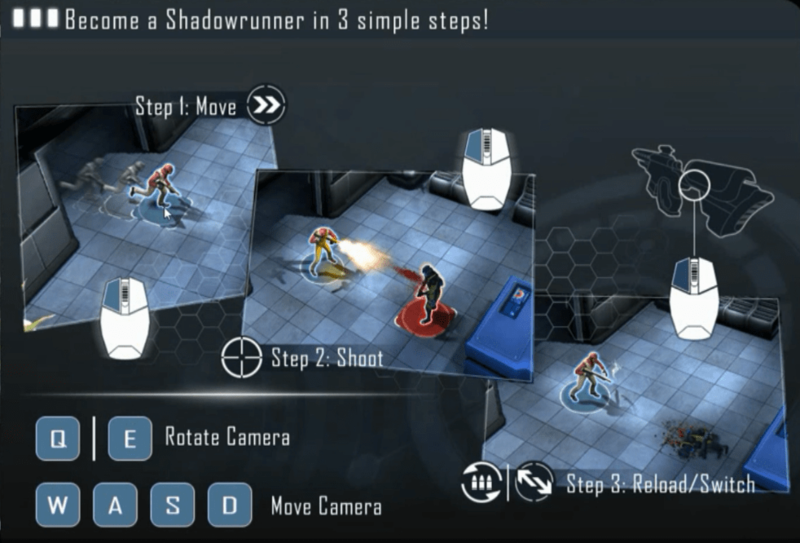 Become a Shadowrunner in 3 simple steps, baby. Best. Manual. Ever? Once you finish reading that War and Peace of game manuals and spend a few minutes getting a handle on the interface, the next thing you’ll find out is the combat missions in their current form are pretty hard and there is no difficulty level option, nor is there healing of any kind, whether medicinal or magical. Let me say that again, because it threw me for a loop in a turn-based, combat scenario based on Shadowrun rules. There is no magical healing. There is no inventory with cool stuff including medkits and trauma kits. I understand that this is early access, yet it still threw me for a loop. So if you are going to dive into Early Access at this point like I have, just save yourself some time and frustration. There is no healing. There is no inventory. What you see is what you get. You have your weapons, your magic, your skills, your hit points and your movement / Action Points. That’s it. Once you get your mind around that, the perceived difficulty (which is never easy, mind you) goes down somewhat as you stop wishing and looking for stuff and just focus on using what you have the most effectively and become a better player of the game. For example, for several missions I didn’t rely heavily on the Shaman’s Shield spell, and I wasn’t switching over to his shotgun when enemies came in close. Once I started tinkering with my options I was able to make more progress and feel more in control. It took me about three hours or so to work my way through the four single player missions, and unfortunately I kept running into a bug that didn’t let me finish the fourth but I played enough of it to get the sense of the scenario and it was fun for what I could finish before the bug would storm in and steal my candy. At this point, and remember this is Early Access so let’s keep that in mind in a big way, I can’t really recommend Shadowrun Online for anyone but Shadowrun fans, and even then those that are willing to overlook some frustrations. I don’t think general turn-based combat or RPG fans are going to find enough here to excite them without that extra draw of the Shadowrun universe. What I feel is there at this point, is paying to beta test, and the beta test is just a small portion of the game. I know that may sound like a knock on the developers, but that is not my intent. They have been clear about what to expect if you pay for the game for Early Access. I do look forward to seeing what upcoming changes and fixes bring to the game and plan to keep posting as it progresses. Note: Keep in mind that I haven’t dug into the multiplayer Arena yet, and that may change my opinion of the worthiness of investing in the game at this moment in its development. Thanks for reading and / or watching! About the Game: Experience the online version of one of the most successful pen and paper RPGs ever. Set in a dystopian 2075, where magic meets technology, you can experience Shadowruns with your friends and plenty of enemies! Live your life on the edge, fight corporations and gangs and stay alive doing the most dangerous job of all: Shadowrunner. There is blood on the streets of Boston, Megacorporations are at each other’s throats, a dark secret has been unveiled and a dragon has awoken. It’s a great time to run the shadows… if you manage to survive! Shadowrun Online will be a turn-based tactical RPG with a deep and variable character system, magic, hacking and combat galore as well as a number of unique features, such as a campaign evolving based on the collective actions of the players. Very great post. I just stumbled upon your weblog and wanted to mention that I’ve truly enjoyed browsing your blog posts.